– Sophomore center Ali Brigham recorded a triple-double to help the Panthers earn the road win and stay within a game of first place Mansfield. Brigham scored 15 points, recorded 13 rebounds, and had 10 blocks on the night. – Franklin junior Mia Lizotte won the all-around for the third straight meet with a 35.95, edging out Oliver Ames’ Hannah Moynihan (35.5). Lizotte earned an 8.85 on beam, an 8.7 on bars and a 9.2 on both vault and floor. Franklin senior Liz Traphagen was second for the Panthers on the vault (8.2) and the floor (9.0). Junior Sadie Rondeau was second for the Panthers on both the bars and the beam. "The Franklin boys basketball team had little trouble finding its defensive identity this season, which is a big reason why the Panthers have won six of their first seven games. The search for an identity on the offensive end, however, has taken a little bit longer. 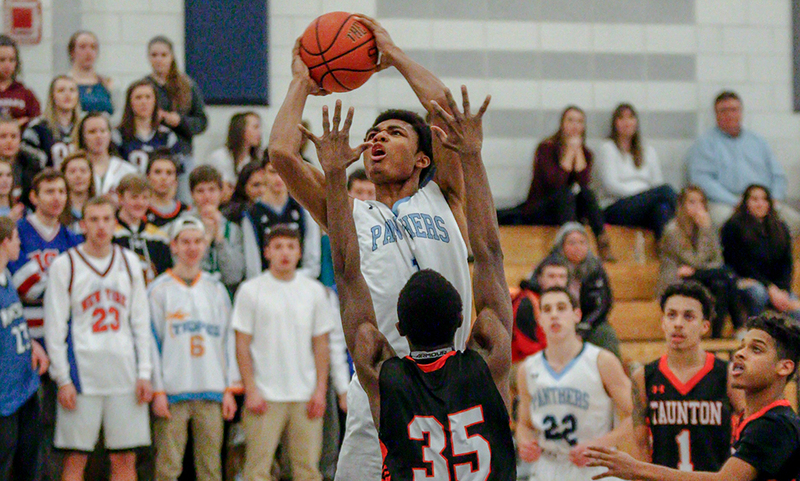 But the Panthers seemed to find the balance they need in a 72-60 win over Taunton on Tuesday night. The Panthers exploded for 27 points in the third quarter, turning what was just an eight-point lead into a comfortable 20-point cushion with just eight minutes left. “I think we were just more aggressive and shared the ball,” said Franklin head coach CJ Neely. “When we play aggressive and guys look to attack the paint, and then when they get in there and make good decisions that can be the difference." [Girls Winter Varsity Swimming] Franklin HS defeats Attleboro HS, 103 to 67. [Boys Winter Varsity Swimming] Franklin HS defeats Attleboro HS, 126 to 45.